BC Ministry of Mines records indicate that production of placer gold in this area was first reported in 1877, and may have commenced as early as 1860. In July of 1885 there was a major gold strike, and when word got out there was soon an extrordinary influx of people. Many were Chinese Canadians and American immigrants. Estimates of the population vary wildly, but the pictures shown here give some idea of the size of town which developed. A post office by the name of "Granite Creek" was established June 1, 1886. It is noteworthy that this area had long been easily accesible from several directions. The picture above-right shows the Wallace Hotel on the left and Cook's store on the right. Cook also built a store in Coalmont when that town started, and eventually had stores in both towns and Princeton as well. There were several hotels in Granite, as it was generally called locally. 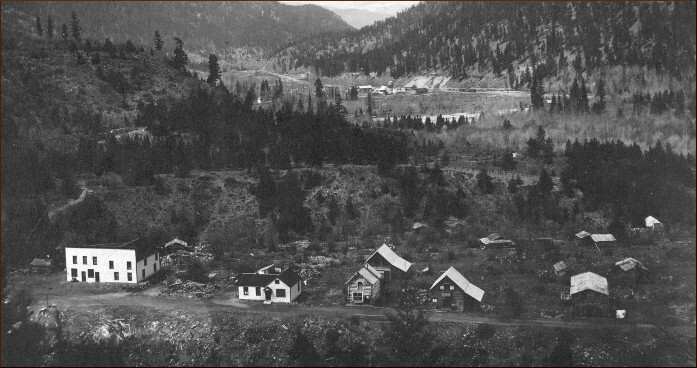 The most prominent, Granite Creek Hotel, can be seen in the lower picture. The little town was perched on the bench above the river, but there were some cabins in the surrounding area. Shown here is Frenchy's cabin and garden at the entrance to town. 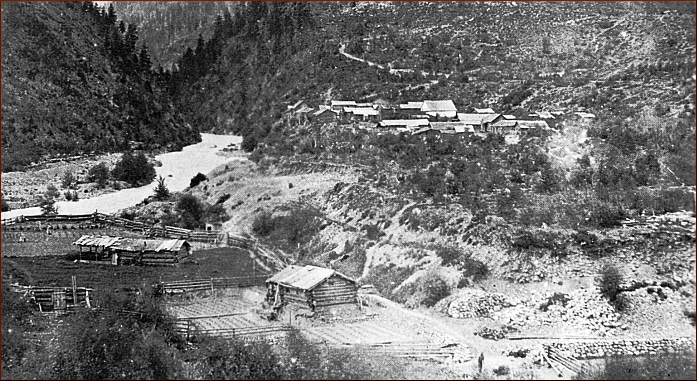 Gold production dropped sharply by 1889 causing many people to leave, and there was a major fire in 1907. Granite nevertheless survived for some years after that. In 1910 Columbia Coal and Coke Company opened their offices there, but with the building of Coalmont in 1912 there was less reason for the town to exist. Still, the Granite Creek Post Office didn't close until March 31, 1918. The lower picture shows Coalmont in the background and the geographical relationship between the two towns. Over the next few decades Granite Creek became slowly abandoned and eventually overgrown but there were still people living there in 1925. There is much more detailed historical information in our archives. The GCPS is interested in collecting and preserving all information regarding the history of Granite. If you have any old photographs or records which you can share, please let us know via the contact form. please become a member of the society.